Thinking about the best places to sell watches? You can be fully confident NYC Bullion is a place you can sell a vintage watch or a sell a gold watch for a generous quote. Among many stores where you can sell jewelry in NYC, we are one of the few where you can sell used watches and receive a big cash payout. Selling old watches can be an overwhelming process because you need them to be appraised by certified experts. Don’t worry, we’ve got you covered – here at NYC Bullion you can sell your watch and receive a comfortable, safe and honest experience. Whether you choose to sell a watch online or find a store in NYC, all you have to do is to contact us. When selling watches online, you simply need to fill out the “Get an offer now” form and you’ll receive your quote in no time! If you want to get an in-store professional assessment when you decide to sell your watch, just stop by at our location, in the heart of NYC – in the Diamond District. Come visit us to receive the best cash for watches payout today! Where to Sell Your Watch? Looking for an answer to “Where can I sell my watch for cash?” You have found the best place to sell watches. Here, at NYCBullion, we will guide you and answer any of your questions related to selling a watch online or in-store and getting the highest cash payout for it. Contact us by email or phone, or, if you prefer a personal appraisal when you choose to sell a watch, just visit our store in Manhattan. Our team of certified professional jewelers will authenticate your watch right in front of you, so you can be sure you will get the most accurate information about your precious watch. 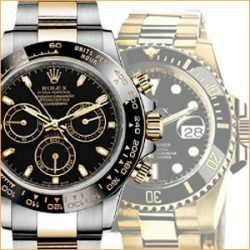 You can be fully confident to entrust your valuable watch in the hands of our top-notch experts – they have years of expertise in appraising vintage, gold, and other precious metal watches. If you choose to sell a watch online, all you have to do is access the “Get an offer now” form and fill in all the necessary blanks to get your free appraisal by e-mail. If you choose to sell your watches in-store, simply stop by at our location in the Diamond District and receive your free evaluation in no time! Our qualified staff of high-class jewelry experts is always happy to assist you in any matters when buying your precious watches. Whether you pick an online assessment or an in-store authentication, we guarantee you will be fully satisfied with our customer service experience, leaving our store with a smile and a big cash payout in your pockets!